Omi at Chadstone was good when I first tried it. Their chips were crispy and filling. Omi then closed temporary as Chadstone Shopping Centre was getting their lower ground floor foodcourt redone. I have since visited and they now have a dining area with table service rather than using the old foodcourt set up. Interior of OMI is modern and clean, which make it nice and cosy. You could order at the counter or waited to be served and pay later. 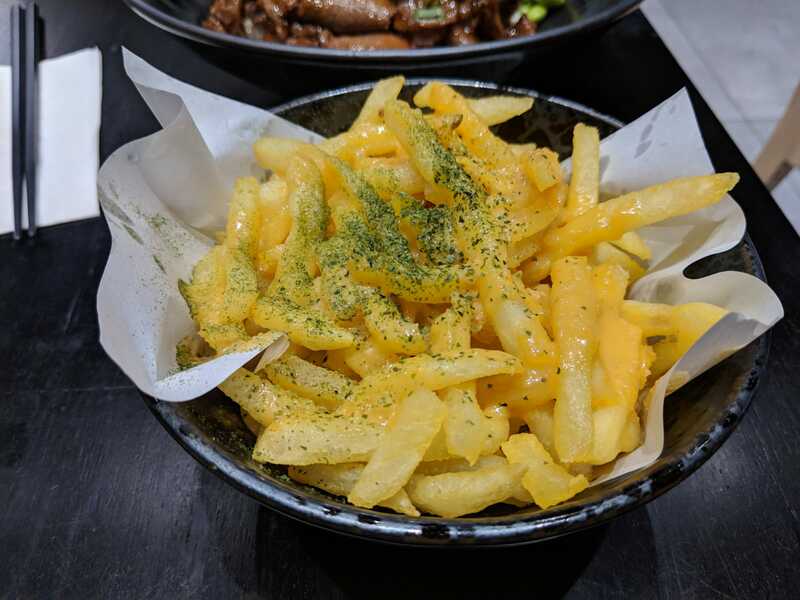 Their Salted egg fries, $6.90 came first sprinkled with some umami. It was a nice touch to the flavours. However I found the salted egg too soggy. It made the chips damp and not crispy or easy to eat. Because it’s salted egg, it was very filling and without any crunch in the chips, it made it harder to finish the snack. I’d prefer a little drizzle over the freshly made chips or have the salted egg less liquidy like their previous recipe. I’m not sure whether OMI had changed hands or not, but the chips was different to when it first opened. Even when I compare the photo in their menu, it’s different. Hope this was just a one-off mistake. For mains, we ordered their Signature Wagyu, $14.90 and their Singaporean Chilli Crab (soft shell), $17.90. J ordered the wagyu dish, the wagyu was seared well, generous serving of Wagyu there. The flavour was good, but not the best that I’ve tried. But we definitely feel that it’s a solid dish given the price charged. Their chilli crab don sure had a kick of chilli in there. But tolerable with my tastebuds. Batter wasn’t too thick which was reassuring. But it’s definitely the sauce that made me enjoy it all. I’m not sure if it’s a phase or note, but I quite enjoy a soft boiled egg with rice and mixing it together in my meal. It’s creamy yet light enough to make it easy to finish my don without leaving a speck of rice behind! Broadbeans were a good addition to both dons with some pickled ginger for freshness. Overall, I’d enjoy my visit, it’s not an expensive meal and offers a decent amount of serving. Hopefully for the next time we revisit, the salted egg fries are less soggy. I’d recommend trying their Singaporean Chilli Crab Don!